Acclimate™ Series Packaged Cooling and Heating Units Acclimate™ Series packaged units are ENERGY STAR® qualified models that offer at least 15% to 25% higher energy efficiency than standard models in an all-in-one space saving cabinet.Every Luxaire® system is built with pride according to strict guidelines to provide years of trouble free operation. That’s why our products are backed by some of the best warranties in the business. For example, our Acclimate™ Series Heat Pumps come with a Lifetime Limited Warranty on the compressor and 10-year Limited Warranty on parts. 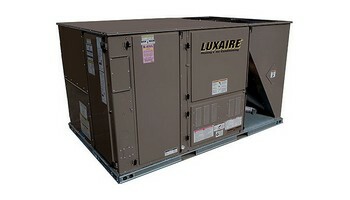 And select LX Series split system air conditioners (TC7, TW4, TC3, TC4, TF4, TF3) come with a 1-year labor limited warranty – if your home comfort system is delivered and does not function, you have peace of mind knowing the repair will be covered at no additional charge, including the cost of labor. Our warranties provide more than minimal coverage. In many cases they lead the industry by covering parts and key mechanical components for longer terms than other manufacturers. Terms and coverage details vary according to the Luxaire products you own -- see your dealer for details. Our warranty coverage doesn’t stop there. Your Luxaire Dealer can provide you with the lasting peace of mind that comes from the best extended protection plan in the industry, the Luxaire Performance Promise™ Protection Plan. Purchased separately, this plan extends your parts, labor or parts-and-labor warranty for up to ten years - and there are no limits to the number of service calls and repairs that are covered by the policy. LX Series Packaged Cooling and Heating Units LX Series packaged units meet the latest Federal efficiency requirements with a quality-engineered, all-in-one space saving cabinet. Every Luxaire® system is built with pride according to strict guidelines to provide years of trouble free operation. That’s why our products are backed by some of the best warranties in the business. For example, our Acclimate™ Series Heat Pumps come with a Lifetime Limited Warranty on the compressor and 10-year Limited Warranty on parts. And select LX Series split system air conditioners (TC7, TW4, TC3, TC4, TF4, TF3) come with a 1-year labor limited warranty – if your home comfort system is delivered and does not function, you have peace of mind knowing the repair will be covered at no additional charge, including the cost of labor. Our warranties provide more than minimal coverage. In many cases they lead the industry by covering parts and key mechanical components for longer terms than other manufacturers. Terms and coverage details vary according to the Luxaire® products you own -- see your dealer for details. Plus you benefit from these valuable advantages:Protects you against rising repair costsPaid via a one-time payment at time of purchase Worry-free costs of regular business hour service callsFast and easy access to service from the Luxaire® Dealer who sold you your system The Performance Promise™ Protection Plan is designed to help keep your home comfort system running at peak performance—without expensive repair costs. Protect your investment. Contact your Luxaire Dealer and ask about the Performance Promise™ Protection Plan today.14 SEER/11 EER/81% AFUE2 - 5 tons Single-phase R-410A Compact, all-in-one package 1-Year Labor Limited Warranty*10-year limited compressor warranty Lifetime limited heat exchanger warranty*10-year limited parts warranty* System must be registered online within 90 days of installation. Otherwise warranty reverts to the standard 20-year limited heat exchanger warranty.